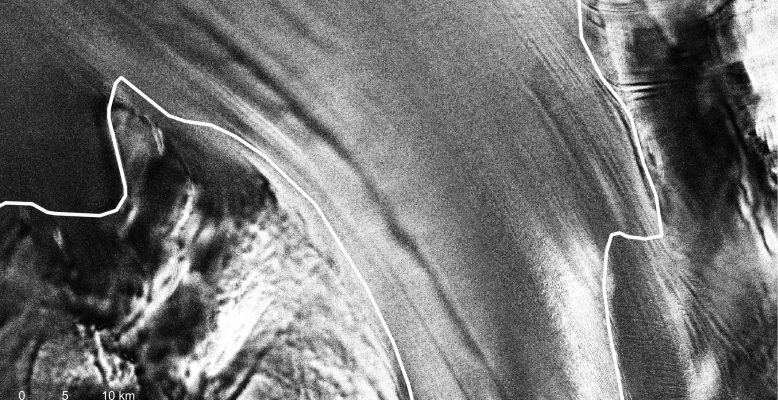 Radar images of ice shelves show at some locations astonishing features – elongated structures that extend for tens to hundreds of kilometers before they fade out. Where do they come from? Radar waves get to some extent scattered by the surface. A tilted surface is scattering the waves differently from a level surface and thus to quite some degree the elongated features are caused by the topography. While TerraSAR-X scenes give a first indication for topographic features, digital elevation models from TanDEM-X resolve the topography, even though there are just a few meters of difference between the surface outside and inside the channel. An example from the extension of Support Force Glacier forming the Filchner Ice Shelf, Antarctica, is shown here. A field campaign in 2015/16 studied this channel in depth by a radar traverse carried out by Angelika Humbert and Daniel Steinhage. Using ground penetrating radar shows that the ice inside the channel is about 200m thinner than the surrounding ice shelf. This could be either due to strong basal melt driven by ocean water only, or a channel that was originally formed underneath the ice sheet and then deepened due to enhanced melt of this already formed structure. 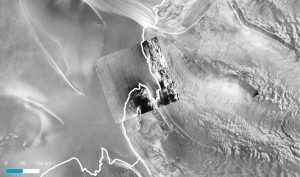 As already indicated by the TerraSAR-X imagery, the channel becomes more pronounced further downstream the grounding line, while after some tenth of kilometres it disappears. Once ice is melted at the lower side, the ice reacts visco-elastically. That means that the ice surface is lowered instantaneously, due to the elastic properties of the ice, while over time the ice responds viscously and the surface is lowering further by creeping until the hydrostatic equilibrium is reached as according to Archimedes principle. At the same time the ice shelf is thinning due to creep and thus the difference of the ice thickness inside and outside the channel is decreasing – the ice surface becomes more and more leveled and thus the radar scattering is becoming more even. In the future, a satellite mission like the proposed Tandem-L mission would allow us to obtain a new view on features like this melt channel: its capability to perform SAR tomography would reveal the individual layers down to a depth of several tens of meters. This new technique could track the layers continuously over a large area and would thus allow studying the visco-elastic response in an entirely new way.